My Grandfather, Edward Farthing, Sr was born in England, June 24, 1853. As a young man he enlisted in Queen Victoria's Navy and made two trips around the world while serving there. Before he made his last trip around the world, he and Eliza Kimber had made plans to marry when he returned. Eliza Kimber was born in East Cowes, Isle of Wight, England, December 8, 1853. Her parent were John & Louisa Kimber. As a young girl she was blind and so unable to attend the public schools. Her parents taught her all they could at home and finally a miracle happened. A doctor was able to restore her sight through surgery. Her Mother, Louise Kimber, was a very serious, strict, no nonsense sort of person. And brought Grandma up with a firm hand. Victoria was Queen at the time and Victoria's ideals and customs were carried out in the Kimber household. Grandfather was experiencing the same treatment at his home. His mother Susan Moors Farthing was a dignified stately lady and Grandpa was very much like her. Grandpa's Father, Henry, died when Grandpa was a boy and his Mother eventually remarried. She married Mr Fred Carpenter and they migrated to America and settled in Salt Lake City, Utah. As a young girl and a young man in England in the Isle of Wight, Edward & Eliza had a very delightful and interesting childhood. I heard of Grandma mentioning the visits of Queen Victoria to the Island. At that time Queen Victoria had a beautiful home there called Osborne House and I ahve heard Grandma say that when the Queen made her visits all the young people in the neighborhood used to go down to the street where her coach would pass and would scatter rose petals in front of the Queen's coach. That always gave me quite a thrill. For some reason I have always been interested in Queen's and I always listed eagerly to this. Another fun thing for all was the Cowes Regatla - which was a sail-boat race. Grandma always loved boats of the ocean and really missed it. Grandpa had met Grandma, as I ahve said, when they were young people and they fell in love. Before Grandpa started on his last trip round the world they made plans to marry when he returned. Communications not being what they are today, Grandma didn't hear very often from him and finally letters stopped altogeher. Her family and friends said that he was lost for good and that she should forget him. As the months went into years Grandma about decided that he was gone and yet she couldn't believe that he would not return. She met another nice man, a Mr Nelson, who wanted to marry her. But Grandma told him that she would never love him and if Ed Farthing ever came home, she would marry him. Finally some of Grandpa's clothing and effects that he had left at home were falling to pieces and the superstitious people in ther neighborhood said that was a sure sign that Grandpa was dead. One day Grandma looked out the window & there was Gramp coming up the walk with the Chinese material for her wedding dress that he had promised to bring her, and all sorts of gifts. His ship had been wrecked and he had been on an island in the South Pacific all this time. Finally a ship happened to come by and pick up the crew. They were married as soon as all the plans could be made on March 23, 1874. Harry and Ted were born in England and when Harry was three and Ted two, Grandpa decided that he would like to leave England and visit his mother in Salt Lake. Great Grandmother Kimber urged Grandma to stay in England and let Grandpa go alone to America. But Grandma said that she would never be away from him again. So she made plans to for the boys and go with him. They set sail on the S.S. City of Richmond from Liverpool England. It was a long hard trip in sailing ships those days and the weather was terrible. They were battened down for days and the ship floundered in the storm. They arrived in Castle Gardens Aug 27, 1878. They finally arrived in Salt Lake after a long trip across the country by train in 1878. On the 9th of January 1879, Grandma gave birth to a pair of twin boys that they named Frank and Fred. The boys both passed away on August 2nd 1879, at the age of 8 months. They had dysentery. On July 4th, 1880, a daughter was born and my Grandfather, who by this time loved the United States, promised to give her a patriotic name, so he called her Alice Liberty, and put a United States Flag in her hand. The first thing she had ever held in her hand. After Alice's birth, Grandma's health was not too good. The doctor suggested that a change of climate might be good for her. All thought of returning to England was gone by now because Grandpa loved America and all of it's challenges. There was much talk of opportunity in Wyoming. Of course the gold mining had passed its peak in South Pass but it was still going on at a great rate. We had a post at the Fort, now Fort Washakie, and there was lots of activity over there. So Grandpa thought it was quite a challenge to come to Wyoming and so he joined a wagon train. He bought a covered wagon and some strong horses and all the necessary equipment. The party on the wagon train included Mr & Mrs Robert Warnock and their daughter Ethel. My Great Grandparents, Mr and Mrs Fred Carpenter came along too. Also the Grimmet family. They all came together across the Oregon Trail. The Indians were bad then. However they didn't have any difficulty with them but they lived in dread that they would and every night parked their wagons in a circle so they would have protection. It took them a month to drive to Lander from Salt Lake. They reached Lander Valley, September 3, 1881. Wyoming was still a Territory then. When the party reached Main Street, Mr Grimmet went into the Baldwin Store and bought a pound of butter and I can see my Grandmother telling this today. "Mr Grimmet came out of the store with a pound of butter and said, Butter, 40 cents a pound. " They thought that was a terrible price to pay for butter. I wonder what they would think today? They brought dried fruit to the valley. Grandma had learned how to dry fruit while she was in Sale Lake, also corn, beans and peas. And she showed the Lander women how she had done it and they were very enthusiastic. Particularly about the dried apples that she had brought. Grandpa was a carpenter, a paper hanger, a plasterer and a painter. In this new frontier town there was great demand for his services. They located on the farm that now belongs to Walter Ellis, up Sinks Canyon way. The first job that Grandpa got was to build a fence around the cemetery in Baldwins field east of town for Mr Robert Barnabee (near Ford Garage). He was Mrs Ella Grimmet's father. In return for his services he received a milk cow, the first he ever owned. There are no records at least to my knowledge, but in the cemetery, among others, were Mrs Eugene Ammoretti, Sr and a daughter of Mr and Mrs Ervin Cheney, Sr, also Bill Hickman, who was one of the destroying angels of the Mormons. On January 3rd, 1883, Tom was born to the little family. In February 1885 Hilda Louise was born. She lived six months and passed away, making the second grief for the family. On April 9, 1886, Alfred ws born. He was so tiny and frail that he had to be carried on a pillow for several months. Before Tom's birth the family had bought a farm down on the river below the State School. They gave a sewing machine that Grandma had brought with her over the Oregon Trail as part payment on this place. Grandpa built a log house and in it were built portholes so that they could use guns in case the Indians were bad and the Indians weren't friendly at this time. Grandpa always took a gun along with him on the plow when he was working in the field. There was a great deal of brush along the Poposia and someone was always sending word that the Indians were skulking in the brush and might set fire to it at anytime. This all caused my little Grandmother considerable alarm. By now she was so homesick and often cried for her mother. Grandpa promised to take her home as soon as he could sell the farm. But he never did. One day Grandma was boiling a fresh beef heart when seven young Indian braves came to the door. They were naked except for a breach cloth. They motioned that they wanted the meat. Grandma didn't argue with them so she put the heart on a platter. The Indians sat down on the floor with the heart and with their knives they divided it among themselves and gave Uncle Tom, who was just a baby crawling on the floor, a piece of it too. After they finished eating they left. Although the family lived in fear of the Indians they were never molested by them. They often stopped by to trade beadwork and buckskin things for coffee, tobaccco or bright colored cloth. As time went by they became good friends of my grandparents. Grandpa finally sold this farm and bought one up Sinks Canyon way. I don't know who owns it now but it has been known as the Saul place for years since Grandpa sold it. George was born there in 1887. William Leonard was born there in 1889 and William died in 1891 and was buried in the little country cemetery at Borners Garden. Roy was born August 2nd, 1891 and their last child, Amelia Grace, more familiarly known to us as Dottie, was born December the 16, 1892. Grandpa sold this ranch and bought some land in what is now known as Piper lane and the place was recently owned by the Pipers and Robert Benstons. This was a fine farm with good soil. Grandpa planted an apple orchard as he had done on all the other places. He put in a fine windbreak and planted many lovely trees around the yard. Some of the old apple and shade trees are still standing. My Grandmother's sister, Emily came out from England to visit and took the stage from Rawlins to Lander. When they got to Beaver Hill, Aunt Emily got out- -she was not about to ride down the Hogs backs and I don't blame her. She was afraid of the Indians too. Aunt Emily would crawl under a round Victorian table that Grandma had with a cloth that came to the floor whenever an Indian came near. She finally went back to England. She said that she would rather go back and live on bread and water, if need be, than live here and have plenty. The family was fast growing up. In 1898 Harry married Dola Mortimore. Ted married Ethel Ellison and on March the 27th, 1907, Alice, who was my mother, married Fred Adams. The Reverend John Roberts, who had come from Wales in 1883 married them. This great man was a very good friend of the Farthing family. They were married at the Farthing residence. Tom Farthing married Ella McBride who passed away when their child was born. Tom, years later, married Laura Anderson. Life during the years, while the family was growing up was fun with young people in and out of the house all the time. Grandmother and my Mother, Alice, were good cooks and quantities of food were prepared for weekend visitors. Grandpa played the flaggalet and consertina and the young people danced and had candy pulls and so forth for entertainment. Also, the neighborhood had built an entertainment hall at Borners Garden and the young people used to have many dance in that hall. Grandpa had the first nursery here in Lander. He sold apple trees, evergreens etc, to the local residents. Some of the evergreens, the oldest ones at the Court House grounds were from his nursery and he helped plant them. He also helped in the early days at the State Experimental Farm, ordering different specimens and plants for the farm. He was always very interested in anything that grew, he was a find gardner. He was a member of the Commission appointed by legislature to run the farm. Grandpa was interested and instrumental in getting the Fremont County Fair started and also the State Fair at Douglas. I read in one of the old Wyoming State Journals that if it hadn't been for him the fair would have closed down. He really got on the ball and got everyone around town interested in taking things to the fair. He grew find vegetables and fruits on his farm and every week would make a trip over to Fort Washakie to the Indian School with eggs, butter and vegetables. He drove over in his buggy. He was a loyal and active member of the Odd Fellows, Knights of Pythias, and Woodmen of the World lodges. He was Justice of the Peace for several years. When I was a child I used to stay with my Grandparents a great deal. I can remember that Grandpa would often sit up with sick lodge members. That was a regular occurance. They used to do that in the early days, I think, more than they do now. Whenever anybody was sick the lodge members would take turns sitting and if anyone died, somebody had to go to the mortuary and sit up with the body at night. I even have gone with my Grandmother and have done that. I'm glad they don't do that anymore. Thats one improvement anyway. They sold the last ranch they owned and moved to town. The family had scattered now and Grandpa said he just couldn't carry on alone. He built a rooming house on Sweetwater Street. They sent their son, George, to College in Lincoln, Nebraska. George had been very interested in College baseball and was a member of the Chicago White Sox Baseball team after college. He was a left handed pitcher and did very well. Their daughter Dottie was also in school in Lincoln. George met Edna Morsch at college and later married her. Their only son Robert was taken prisoner in Korea and died there during the Korean conflict in 1951. Dottie married Earl McKinney and Roy married Nettie Adams. After building the rooming house Grandpa bought a lot on Wood Street and built the last family home there. My brother Jim later bought the home and reared his famly there. Grandpa's health was failing rapidly in the 1920's. He had always been bothered by Asthma and during the cold winter weather he had considerable trouble and several bouts with pneumonia. On August the 9th 1922 he passed away. Grandma, with her wonderful calm and courage stayed on in the house after Grandpa's death. I spent more and more time there then with my Grandmother. The more I saw of her, the more I realized what a remarkable woman she was. She had a very strict moral code and this she tried to instill in all of us. She was a devout member of the Episcopal Church and took me her. She made friends so easily and no one ever left her house empty handed. A jar of freshly made marmalade, jelly, a bouquet of summer flowers or slips of a house plant went home with the visitor. No one came away from her house empty handed. She always had more fresh fruit and fresh game in season than anybody else and never left her house. She had friends by the score. I never knew her to mistreat or be unkind to anyone. She had wonderful white silken hair and always had a faint fragrance of English Lavender about her. Back row l to r: Sons Edward Jr "Ted", John Henry "Harry", Francis "Roy", George Victor, Alfred James "Alfie", Arthur "Tom"
Her next shock, after losing Grandpa, was Uncle Harry's death in 1926. He lost his son Mark in 1922 and he never recovered from it. Uncle Harry had done a great deal of work in the coal mines in Hudson and his lungs were badly affected. Uncle Harry's family, which now, since the death of his son consisted of Dorothy and Ruth & his wife Dola, who lived in Yakima Washington. Uncle Ted's son Harold had returned from college in Nebraska and had married and had two daughters. Uncle Ted had always lived in Lander where he did carpentery. Uncle Roy lived in Oregon and had one son Eugene. 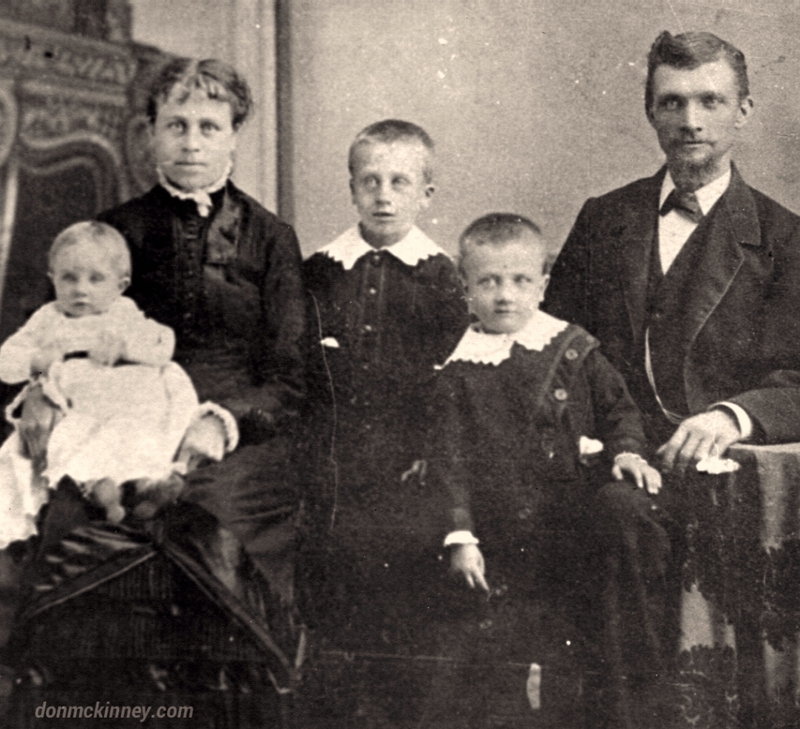 Uncle Tom, who lived on a ranch south of town had three children, Bill, James and Myrna. Aunt Dottie had three children, Lenore, Edward and Donald. Donald served in World War II. Alice and her family, Ila, James and Fred Jr lived in Crowheart. George lived in Denver and they had a daughter Joyce at home and a son Robert, who later died in Korea (Oct 1951). Grandma's son Alfred lived at home with Grandma and did carpenter work in and around Lander. He was an active member of the Knights of Pythias Lodge, like his father. Alfred was a kind and gentle person and my brothers and I adored him. It was a happy day when he came to call at our house. Some of the members of the family were always dropping by Grandma's house. She was delighted to have them all and treated them so royally. Grandma was so alert mentally until her death. She was interested in everything and was well informed too. She was always very style conscious and was not interested in a dowdy appearance. If my hosiery seams were not straight, or she didn't like my hat, she said so. I never left the house without my hat and gloves because according to Grandma, "No lady ever appeared in public without her hat and gloves". I wonder what she would think today? I couldn't close without commenting on Grandma's wonderful ability to make jams, jellies, fruitcakes, plumpuddings, homemade soap and pickles. No one can make fruitcake, puddings or pickles that taste as good as my Grandmother's. On the day after Memorial Day in 1938, after a number of us had been in town for the day, Grandma went down the stairs to the basement for something and fell. When her son Alfred came home he found her unconscious. She suffered a severe concussion and passed away on June 1, 1938. Since then all of her children have passed away. Died: 28 Jun 1964 Grants Pass, OR ?